Alloy wheels are the most common type of wheels on the road today. Most vehicles coming off the assembly line have clear coated alloy wheels, but many drivers enhance their vehicles with aftermarket polished alloy wheels. So, while the wheels may be aluminum alloy, the finish on top is what you have to consider when choosing a wheel cleaner. Brake dust is made of an adhesive and carbon fibers that come off the brake pad and tiny metal shavings from the rotor. The intense heat and friction generated by the wheels makes this mixture highly corrosive. Because you probably drive every day, more brake dust is constantly being made. Frequent cleaning is the only way to keep your wheels safe. Use a Speed Master Wheel Brush to clean wheels without scratching. Towel dry each wheel after cleaning to prevent water spots. We recommend cleaning the wheels before washing your vehicle. 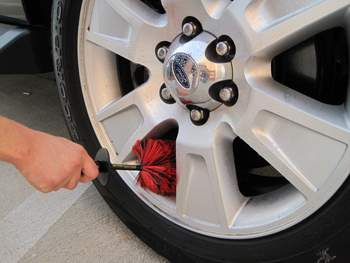 Cleaning wheels first will prevent brake dust and dirty water from splashing onto a clean car. Rinse wheels to remove loose dirt and brake dust. Use a Fire Hose Nozzle to deliver a strong stream of water. Spray one wheel at a time with an alloy wheel cleaner. A few examples are SONAX Wheel Cleaner Full Effect, Wolfgang Tire & Wheel Cleaner, and P21S Wheel Cleaners. These cleaners are non-acidic in order to protect the wheels' finish. Whether you have clear coated or polished alloy wheels, these wheel cleaners are safe choices. 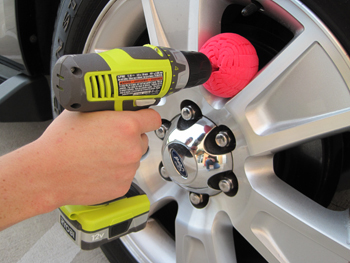 Use a soft bristled wheel brush to agitate the wheel. The Speed Master Wheel Brush is a great choice because it can fit narrow or wide spaces and has a flexible stem. The soft, synthetic bristles loosen grime and brake dust without scratching the wheel finish. Reach through spokes to clean each wheel front to back. Don’t forget the lug nuts. Brake dust hides wherever it can. Use a lug nut brush to clean around the lug nuts and inside the lug nut holes. While you’re working with the brushes, the wheel should remain wet. The water and wheel cleaner help loosen grime, but they also lubricate the wheel surface to prevent scratching. You never you want to let a wheel cleaner dry on the wheel because it will spot the finish. While you’re down there, clean the wheel wells, a.k.a. fender wells. A lot of dirt and mud is kicked up in the wheel wells as the tires roll. You might need something a bit stronger than what you used on the wheels. Spray the wheel well generously with an all purpose cleaner, like McKee's 37 Cleanse-All Exterior Surface Cleaner. Use a long handled brush with sturdy bristles to agitate the wheel well. Note: Do not use your soft wheel brush on the wheel wells. Likewise, do not use the wheel well brush on the wheel itself. Think soft and gentle for wheels, strong and sturdy for wheel wells. Rinse the wheel and wheel well, including the lug nut holes and between the spokes. Always dry wheels. Water spots are unattractive wherever they appear, even on the wheels. 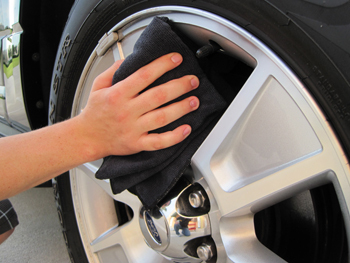 Our Wheel & All Purpose Microfiber Towel is exceptionally gentle on the wheel finish and grabs any residual brake dust. Because the towel is black, you can you use it on wheels without ruining it. To avoid cross-contamination, use this towel only on wheels and wash it separately from your other microfiber towels. Brake dust is the last thing you want on your paint! All the tiny contaminants that stick to your vehicle’s body also stick to the wheels. Add brake dust on top of that. Contaminants don’t care if the alloy is coated or not – they’ll stick to it. Detailing clay is a fantastic tool for removing embedded contamination from wheels. Griot’s Garage Wheel Cleaning Clay is made especially for claying wheels. The good thing about this product is that you have a clearly labeled jar so it’s less likely you’ll confuse the wheel clay with the regular detail clay you use on the paint. You should not mix them up! Always avoid cross-contamination between wheels and paint. 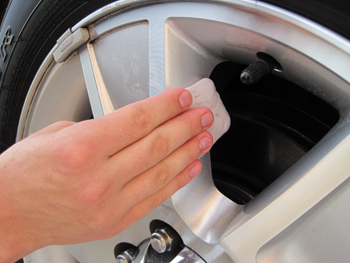 Use a medium grade detailing clay bar to remove embedded brake dust from alloy wheels. Always use wheel detailing clay after cleaning the wheel but before polishing or waxing. Spray the wheel generously with Griot’s Garage Speed Shine or another slippery clay lubricant. Take a quarter of the clay bar and flatten it into a patty over your fingers. Then rub the clay over the wheel. Take care to get between spokes and wherever you can see pitting or black spots. Fold the clay to reveal a clean side as it becomes soiled. When you’re done with each wheel, use the clay lubricant or quick detailer to remove any clay residue and wipe the wheel clean. Do the same on all four wheels. Here again, you have to pick the wheel polish based on what’s on the surface of the alloy wheel. A clear coated alloy wheel requires a less aggressive polish than a bare aluminum alloy wheel. Use a Mothers PowerBall Mini to polish between spokes. Avoid wool polishing balls on clear coated alloy wheels. For clear coated alloys, choose a metal polish that is safe on coated metals. Flitz Metal Polish, Fiberglass & Paint Restorer is a perfect choice. It cleans and polishes clear coated wheels without scratching or dulling the finish. For polished alloy wheels, which have no top coating, you can afford to use something with a little more bite. 3M Mag & Aluminum Polish, Wolfgang Fine Aluminum Polish, and classic Wenol Red are all excellent choices for polishing aluminum alloy. Aluminum alloy can tarnish and rust, unlike clear coated alloy, so these polished are equipped to remove oxidation. For the best results, apply metal polishes to the wheels with a polishing tool, such as Mothers PowerBall Mini MD or the Flitz Polishing Ball. Both will give you the consistent speed and power needed to effectively polish wheels. First, wipe the metal polish of your choice onto the wheel. Apply it to one wheel at a time. With your Mothers PowerBall MD attached to your electric drill, start slowly and spread the polish over the wheel. Gradually increase the speed. Keep the PowerBall moving over the wheel until the polish starts to dry or diminish. Use a soft, clean microfiber towel to wipe the wheel clean. Repeat on all four wheels. Apply a coat of McKee's 37 Wheel Glaze to protect wheels from brake dust. Once your wheels are clean and dry, apply a quality wheel protectant like McKee's 37 Wheel Glaze or Wheel Wax to seal the wheel surface. These products work just like car wax. Apply them with an applicator pad and then buff the wheel. They keep your wheels looking shiny, and they prevent brake dust adhesion. Your wheels look cleaner longer. You have to reapply these products weekly, but it’s better than scrubbing your wheels every two days. The good news is, if you use a wheel wax as recommended, water is the only thing you need to clean your wheels between waxings. Choose your tire dressing carefully. Old-fashioned tire dressings contain silicone, which produces a glossy shine but it turns brown over time. In fact, shiny silicone tire dressings can attract dirt. These dressings deplete the rubber’s own protectants faster, causing it to age prematurely. Newer formulas, like Pinnacle Black Onyx Tire Gel or Optimum Opti-Bond Tire Gel, are water-based and less shiny, but less shiny is the concours look you want. These dressings create the look of new tires with a semi-gloss sheen that doesn’t turn brown. Pinnacle Black Onyx Tire Gel also nourishes the rubber to recreate the look of new tires. You can often layer water-based dressings to get a glossier shine. Follow the directions on the label carefully. Always apply thin coats and allow drying time before you drive your vehicle. Even the best dressing will sling off if it’s on too thick or it doesn’t have time to dry. Avoid pooling of the dressing around raised letters and white walls.